They say diamonds are a girl’s best friend. And I must say that luxury purses are a close second. But what do you do when you can’t afford the designer price tag? Well, you get a designer-inspired handbag like a Chloe bag dupe. 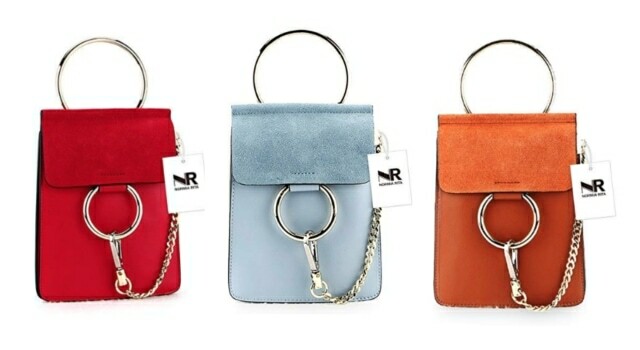 As someone who owns a few luxury bags and designer look-alike handbags, I can tell you that you are not missing a lot by getting a high-quality luxury purse dupe. Aside from losing out on the designer logo and branding, you’d be saving hundreds if not thousands of dollars by shopping for a designer dupe. This post is geared towards helping you get some of the best and most sought after Chloe inspired bags. 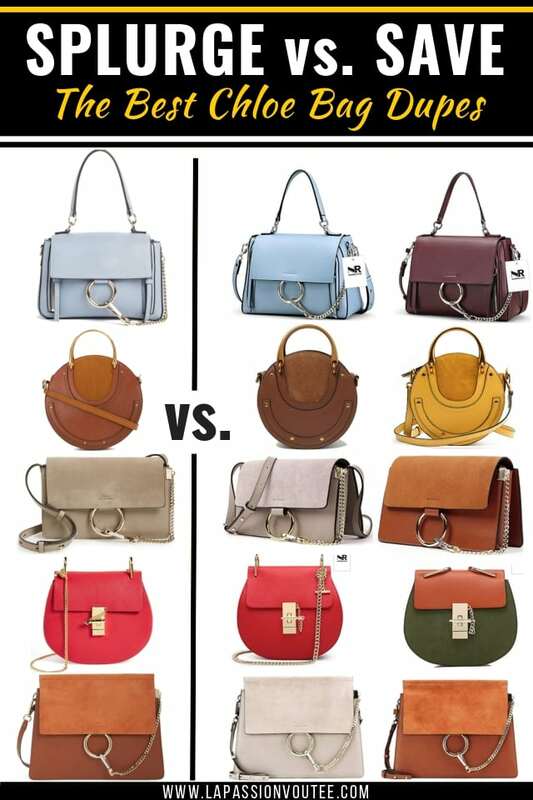 According to the Zoe Report of the most popular designer bags of all time (source), two of Chloe handbags made the cut. It’s no surprise that the Chloe Drew bag is one of those two purses. 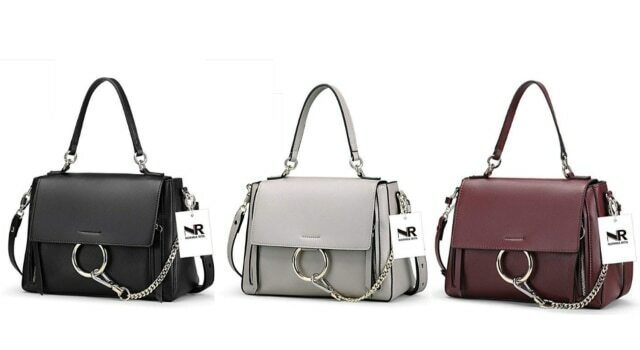 I always like to start off by clarifying the difference between a knockoff designer bag also known as imitation bag and a dupe bag also known as designer inspired or designer look alike. But let’s clear the air first about the difference between a dupe and a knockoff. 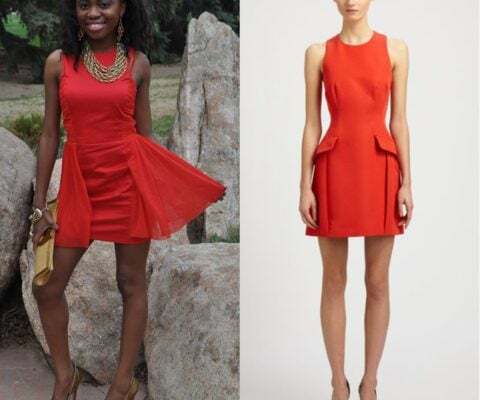 Designer dupes are known as designer-inspired or designer look-alike products. 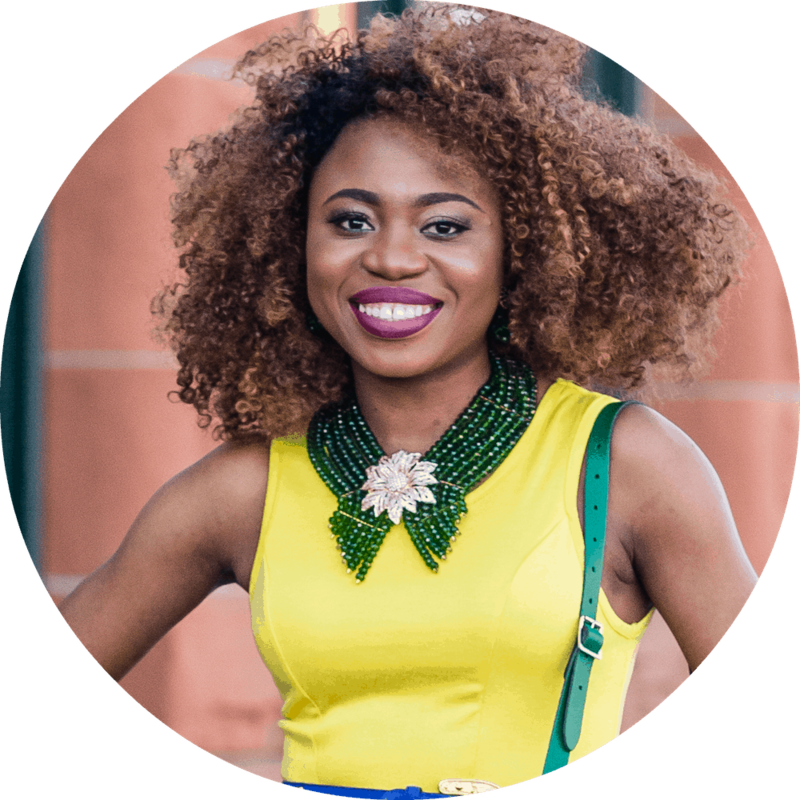 Dupe products are referred to by this term because look like the designer version of the product without passing off as the designer item. You’ll notice that these designer-inspired products lack all trademarked features of the luxury brand. Below is a photo example of a Chanel Boy Bag dupe that I bought years ago. Instead of a Double C Chanel logo, it has a full circle Double O. This is also the same reason a retailer like Topshop (similar) can sell this look-alike of the Gucci Marmont bag without fear of being sued. On the other spectrum, a knockoff is also known as a designer imitation bag. These replica products bearing the logo and proprietary imprints that are not sold or produced by the luxury brand. These are replica goods designed to trick or deceive people into believing that the product is authentic. Generally, knockoff items cost a fraction of the luxury product. However, it is not uncommon to find an imitation product to costs nearly as much as the original. This is the more reason to buy luxury goods directly from the brand or their approved retail partners. In this case, the brand is Chloe and their approved retailer partners include Nordstrom, MyTheresa, Barneys, and Bergdorf Goodman. Regardless of the price and quality, knockoff/imitation/replica products are illegal. You could also get in serious trouble for buying or supporting sellers that sell these products. Ignorance is simply not an excuse. This post is geared towards helping you get some of the best and most sought after Chloe inspired bags. 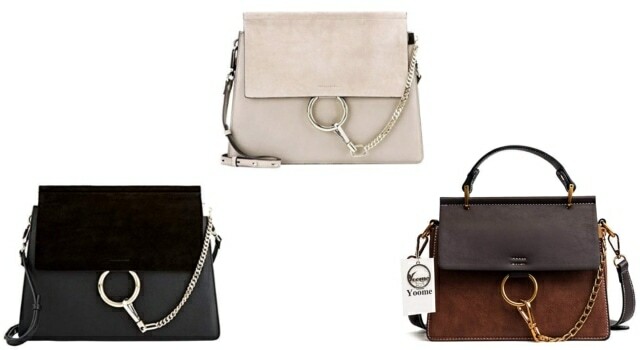 According to the Zoe Report of the most popular designer bags of all time (source), two of Chloe handbags made the cut. 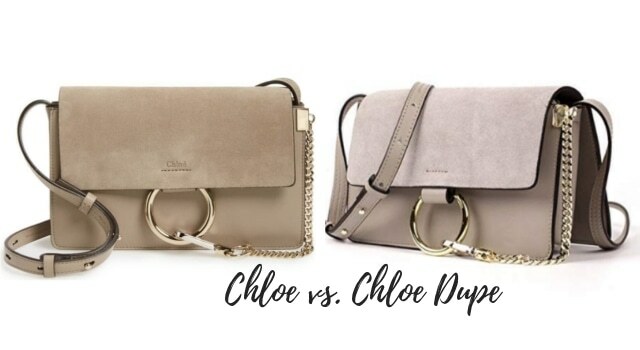 It’s no surprise that the Chloe Drew bag (dupe version) is one of those two purses. Curious to discover the most popular Chloe purses? Here are the 10 best Chloe handbags and the corresponding Chloe dupe bags! LEFT: You’ve probably seen celebrities and major Chloe collectors rock the Chloe Nile bag. The half-moon shape and signature door knob-inspired top handle are the signature that this designer handbag is known for. You definitely won’t miss a beat standing out from the crowd. The Chloé’s Nile Minaudière crossbody bag features exceptionally soft calf leather bag that simply radiates style and class. 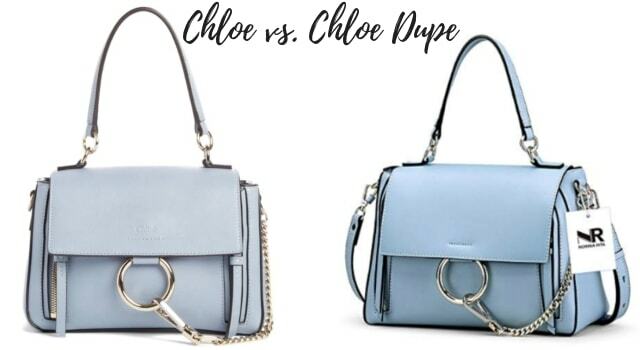 RIGHT: Seriously this Chloe Nile bag dupe looks almost like the real deal! Hey, that’s why I love shopping on Amazon. You get free shipping (i.e., get your item in 2 business days) & return with Prime membership. This Chloe look-alike crossbody bag has quality written all over it down to even the smallest detail. The dupe is tear-resistant, breathable and also has water-resistant punk rivets. This Chloe dupe bag is perfect for carrying small accessories like your phone and makeup. And it is an excellent addition to your night out ensemble. Check out these gorgeous shades too! LEFT: The Chloe Medium Drew Shoulder bag is one of the most popular Chloe bags of all time. The polished golden coloring and Italian leather are two of the many beautiful features on this bag. If you love a spacious bag, the Chloe Drew fits the bill. RIGHT: This high-grade quality Chloe Drew dupe bag has everything you need for comfort and fashion. Multiple zip-pockets line the bag to hold cosmetics and essentials. The shoulder strap is adjustable, and the material is elegant, durable and waterproof leather. The golden chain and U-shaped buckle have been made to perfectly duplicate the original. This Chloe dupe bag also comes in a delicate cream color with a long chain strap and flap front. For a slightly different look, check out this bracelet bag option of this shoulder bag. This highly rated dupe ships free with Amazon Prime (try Amazon Prime for free for 6 months here). LEFT: OMG! The Chloe Drew Bijoux is popping right now! This statement purse is the perfect arm candy and conversation-starter to take anywhere you go. The Mini Chloe Drew Leather bag is precisely what you’re looking for. Any other bag would pale in comparison when set next to this soft, smooth matelassé leather bag with gorgeous necklace-like strap draped in front of the bag. RIGHT: This Chloe Drew dupe bag has multiple zip-pockets to keep your personal effects organized. The quilted saddle bag has an adjustable shoulder strap and a top handle for multi-functional use. The golden chain and U-shaped buckle have been made to almost look like the original. And it is waterproof too! LEFT: The Chloe Faye Bag broke the internet. The unique construction and multiple expandable compartments make this buttery-soft leather and suede shoulder bag one in its class. The stylish equestrian-inspired horseshoe ring and slim golden chain evoke style and practicality. 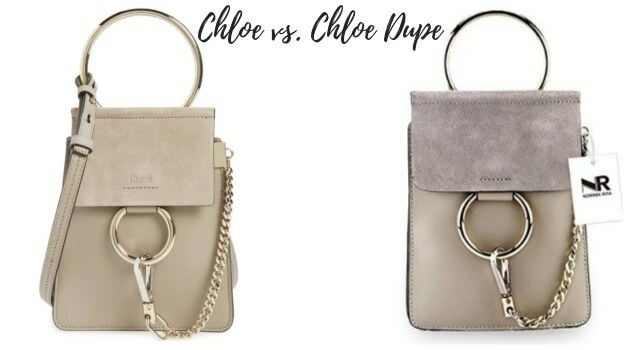 RIGHT: The Chloe Faye Bag dupe bag is a fantastic look-alike version of the original. Nothing better than a high-quality dupe bag made of smooth genuine leather. This stunning Chloe-inspired bag features an elegant chain link and lobster clasp closure on the front with a silver loop clasp. And it is available in caramel, black and soft gray colors. I recommend the caramel as a pop! 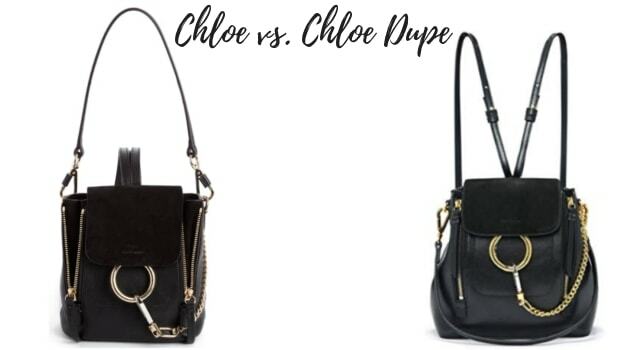 LEFT: The Chloe Small Faye Leather Shoulder Bag is an excellent alternative for those looking for a smaller version of the original Chloe Faye Bag. The beautiful silhouette of this small Chloe Faye bag makes it super desirable. A favorite among many. 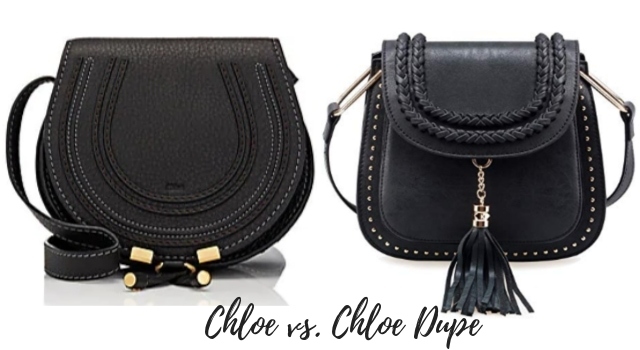 RIGHT: This small Chloe Faye dupe bag is right no! It is made with genuine cowhide to give it a higher-end appeal. The back end has three compartments as well as slip pockets for practicality. 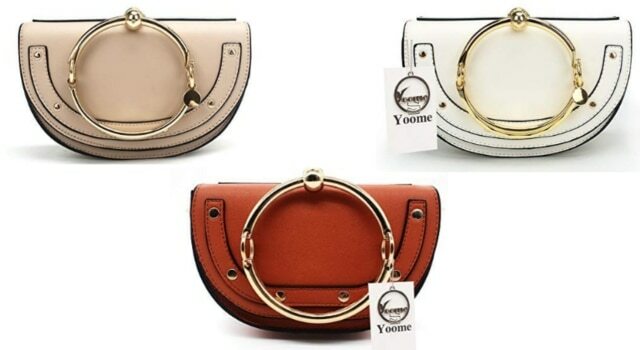 This Chloe bag dupe has a stylish golden lobster clasp and a chain that combine with a silver hoop clasp. This affordable leather dupe bag costs less than 10% of its Chloe counterpart. Check it out here. LEFT: While purses might seem like the obvious choice on a weekend out, they are not always the most practical. The Chloe Faye Backpack is the perfect bag to spice up your look for school, travel, and those looking for an unconventional appeal. Made of durable calf leather, it has a secure flap top and an adjustable shoulder strap. This Chloe bag has one big compartment and several small side zips. The golden chain and ring add a touch of classy sophistication. RIGHT: For a fraction of the price, you can get this Chloe Faye backpack dupe with authentic leather material. Designed with versatility in mind, you can wear this bag as a backpack or as a shoulder bag. The delicate cowhide and quality gold hardware of this Chloe inspired bag will give you that designer satisfaction at an unbeatable price! LEFT: It’s all in the details! The sight of this curvaceous textured Chloe Mini Marcie Bag will have you wishing you had it in every color. This saddle bag has sumptuous equestrian flair that blends smoothly with a variety of looks. 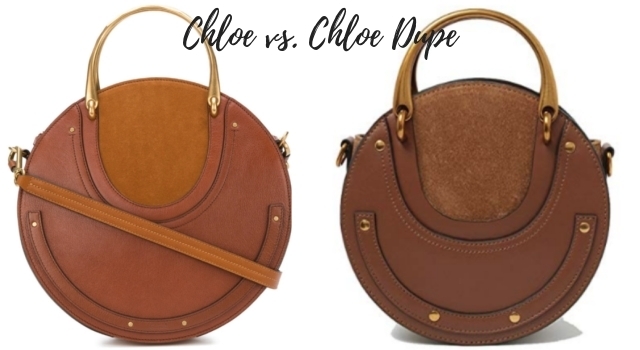 RIGHT: And the this Chloe saddle bag dupe is not too far off from its Marcie counterpart. Perfect for the trendsetter, you can expect that this Chloe Marcie inspired bag will live up to your expectation. This dupe is made from top-quality imported leather. And it makes a great gift for a fashionista on a budget. LEFT: Chloe’s Pixie crossbody bag is the epitome of minimalistic with equestrian influence. The curve appeal and polished hardware accentuate the elegance of this feminine design. As you would expect, the Chloe Pixie bag ranks high as a most wanted purse among Chloe lovers. RIGHT: Nothing but pure beauty, this Chloe ring bag dupe is a striking look-alike of the Chloe Pixie bag. Like many of the top-rated Chloe inspired bags, this dupe features bronze hardware and zipper for functionality: wear the bag as a tote, a shoulder bag or a body bag. You call the shots! 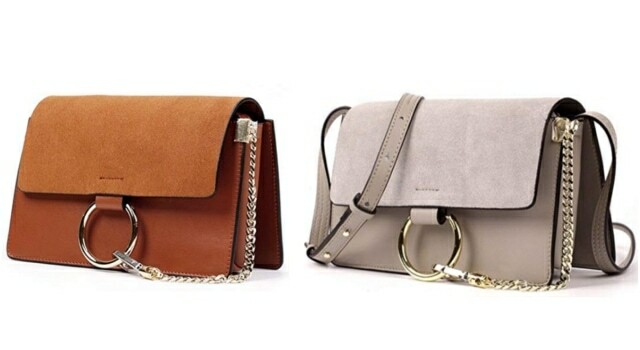 LEFT: This lust-worthy Chloe Mini Faye Day bag is a compact silhouette version of the Faye bag. The scaled-down size of this soft calfskin purse makes it an ideal bag to haul your daily must-haves on a day to day basis. 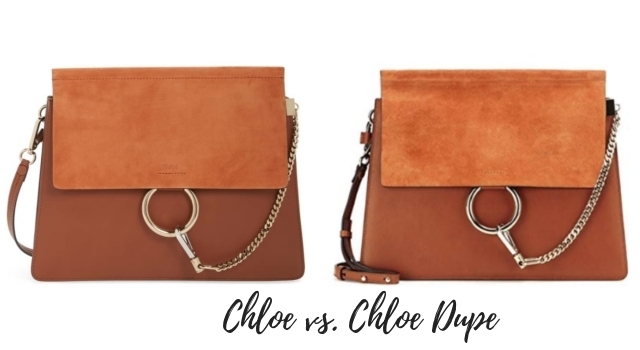 RIGHT: If you have the Chloe Mini Faye Day crossbody on your radar, you will love this stunning Chloe bag dupe. To ensure its durability, this Chloe inspired bag has a glossy polish to protect against fade and dust. 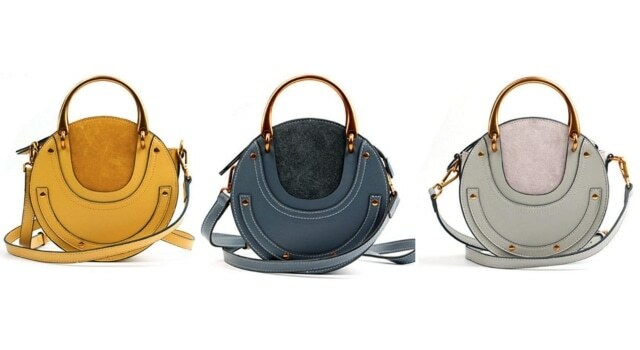 You can score this Chloe bag dupe in one of five colors. That soft blue color is an enticing option (pastel colors are in right now!). LEFT: The style of this accordion-shaped boxy Chloe bag screams elegance and sophistication. Metal chain-and-ring accents add edginess to the Parisian brand’s feminine aesthetic. The unconventional bracelet-inspired loop of the compact bag enhances its versatility as a bracelet bag or crossbody body with the adjustable strap. Perfect for the fashionista with a minimalist preference. 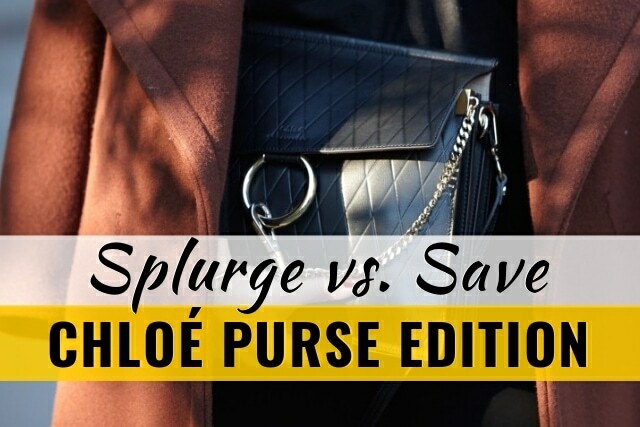 RIGHT: The Chloe bracelet bag dupe features craftsmanship rivaled by no other in this price range. 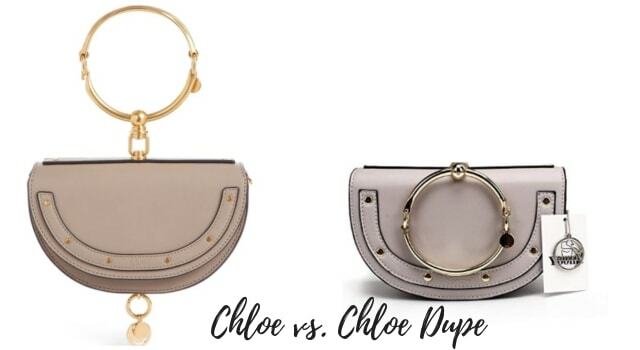 Although this Chloe look-alike bag is a little pricey, this Chloe bracelet bag dupe has all the bells and whistles of the Chloe version. And here you have it, the top 10 most wanted and most sought after Chloe bags. If a Chloe purse is out of your reach, ain’t nothing wrong with starting with one or two Chloe bag dupes. Need help deciding? The Chloe Mini Drew Bijoux Shoulder Bag (dupe version) is the best option for the fashionista who is one with current trends. The necklace-like strap is a dream come through. 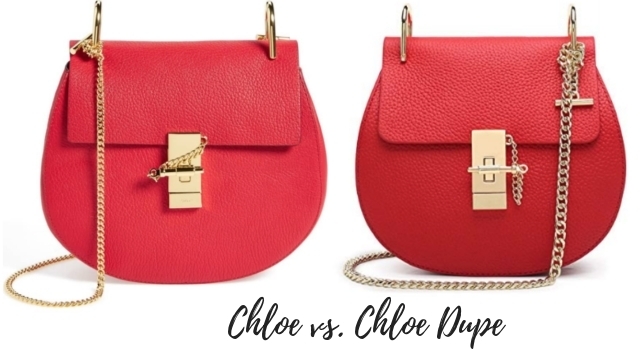 For the fashion lover who goes around with the absolute minimum, the designer-inspired Chloe Bracelet Bag (dupe version) would be the most obvious choice. Plus it doubles up as a mini clutch bag. Finally, the Chloe Marcie Crossbody Bag dupe is our pick for the lady who loves a little space to carry her essentials anywhere she goes. Fun Fact About Chloe: Did you Know? In 1952, Gaby Aghion, an Egyptian-born Parisienne founded Chloe as an opposition against the stiffness of 50s fashion. Opting for body-conscious, minimalist and a feminine palate, Chloe designed a brand that is modern and audacious. 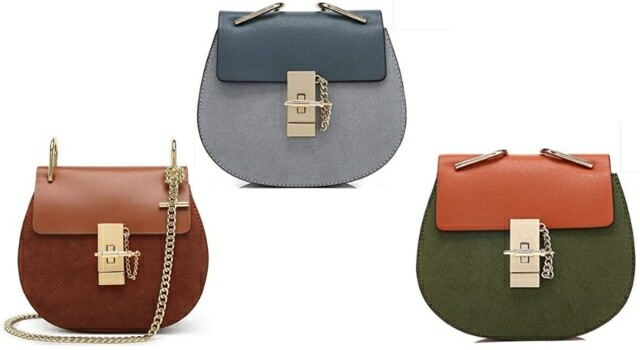 These Chloe bags and Chloe inspired purses are guaranteed the Chloe bags you’ll spot in every style gallery (source). 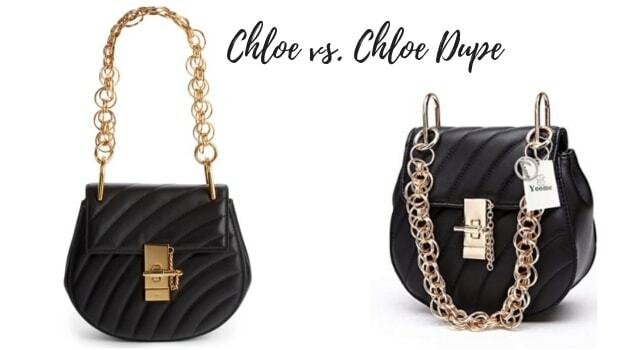 If you loved this roundup post of the top 10 most popular Chloe handbags (and Chloe bag dupes), check out the best Gucci handbag dupes and the most-wanted Chanel handbag dupes. 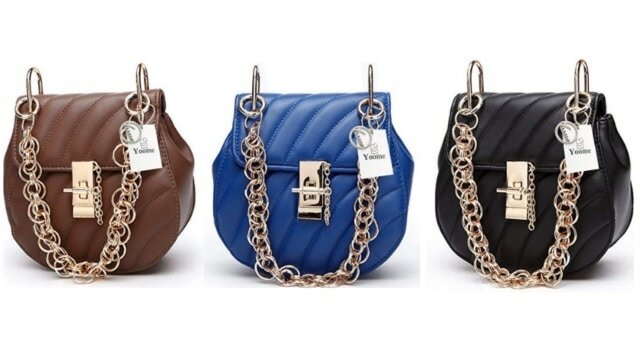 This post features several Gucci and Chanel handbag dupes at a fraction of the price.